DirectX 12 housekeeping for Deus Ex: Mankind Divided. 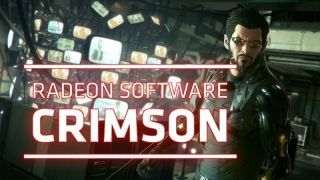 Eidos Montreal has done its part to bring DirectX 12 support to Deus Ex: Mankind Divided by releasing PC patch 5 earlier today, and now AMD has followed suit with a Crimson driver hotfix (16.9.1) to support the API within the game. This is a relatively minor driver update in terms of new features. Other than bringing support for DX12 in Mankind Divided to Radeon graphics card owners, the only other new bit is a Crossfire profile for DirectX 11 in DOTA 2. Total War: Warhammer may experience negative AMD CrossFire scaling on some Radeon RX 400 series configurations. AMD is aware of several lingering issues, including one that can cause mouse corruption intermittently on the Radeon RX 480. It's also working on a fix for some games failing to launch or crashing if the AMD Gaming Evolved overlay is enabled. In the meantime, AMD recommends disabling the overlay if you're affected by the bug. Getting back to Mankind Divided, one thing to keep in mind is that DX12 support is preliminary at this point (on Eidos Montreal's part). It's still a preview version, so even with the patch in place and updated graphics card drivers, you might still run into issues. The final DX12 release is scheduled to arrive in a couple of weeks, and along with it multi-GPU support. You can download the Crimson 16.9.1 hotfix here.